This week, I’m taking a look at the BIG picture. 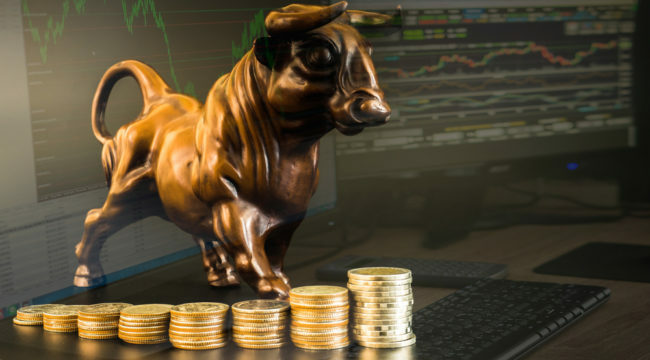 Many investors are currently worried that the bull market may be coming to an end. However, I’ve got a completely different view. And it all boils down to three “themes” that I’m seeing in today’s economy. On Monday, I talked about the first — a historically strong jobs market where jobs available currently outweigh people actively seeking employment. And then on Tuesday, I followed it up with part II — how a robust energy market is putting people back to work in America’s heartland and banking record profits along the way. The third theme that I’m seeing in today’s economy deals with interest rates. Here in the U.S., our Federal Reserve is in a steady pattern of raising interest rates. First, businesses may start to slow down investing in new opportunities because the cost to finance those opportunities is now higher. Think about a company on the fence whether to expand into a new region. Interest costs on plant, property and equipment just to get the business up and running could add thousands (if not millions) of dollars to the final cost of the expansion. This is after an almost decade-long stretch when those interest costs were considered peanuts to most businesses, which could discourage some businesses from pulling the trigger. Second, consumers may also find themselves in the same situation as the businesses mentioned above. Think about big purchases that consumers make that are financed by debt — things like homes, cars and appliances. Higher interest rates will turn away buyers that opt to wait until interest rates fall again. And I don’t blame them! And lastly, companies with significant amounts of debt could wind up paying more in interest. This may not be an immediate problem as most companies have fixed interest rates on their existing debts, but those without fixed rates could soon see their liquidity ratios decrease if rates are raised too quickly. Rightfully, investors are on edge. After all, these three arguments point to lower demand for important industries like autos, durable goods and construction supplies. I believe the media is making a bit too much about the risks of higher rates right now. 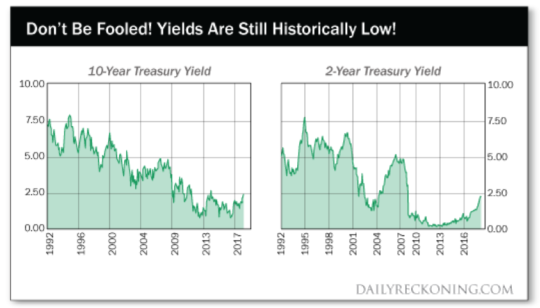 Remember, we’ve had a long period where interest rates were near ZERO for years upon years. And internationally, many countries had negative interest rates! So you got CHARGED to keep balances in government bonds. That’s nuts! So while a period of rising interest rates have often led to pullbacks in the market, we’ve never had a period like this before where rates were coming up from such a low level. I think the hype is overblown and that it’s actually very healthy to bring rates back up to a “normal” level. Just think about all of the savers who have money set aside earning next to nothing. Those people deserve to be able to get a return on their savings to help cover day-to-day life expenses! And higher interest rates can also make companies think more carefully about which growth opportunities really make the most sense. So companies have a natural incentive to be more judicious with their money, leading to less risk for the overall economy. One area that will benefit from higher interest rates is the small cap bank industry. As rates start to move higher, regional banks will be able to charge customers more for loans. And so the interest margin (or the difference between what banks receive, and what they pay depositors) will widen. That’s going to help profits increase and small bank stock prices to advance. Definitely a great spot to take advantage of higher interest rates. So there you have it, the three most important themes that I’m watching are all pointing to a strong economy, which is why I believe this bull market still has legs. To get caught up on the first two themes pushing today’s market higher, see the links below!